This icon board was hand carved and gesso’d by Dylan Hartley; each one takes weeks to complete before being painted by world renowned iconographic, Aidan Hart. 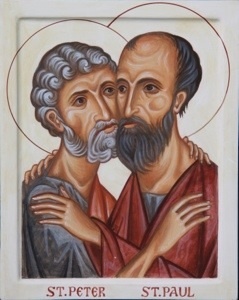 We’re very proud to announce that this one, of St Peter and St Paul, has just been purchased by the Church of England for the new Archbishop of Canterbury to present to the new Pope, Pope Francis. After being kissed and welcomed by them both, it’s now hanging in the Vatican! You can learn to gesso at one our upcoming gesso training courses, you can find details by clicking on the photo of the icon above.